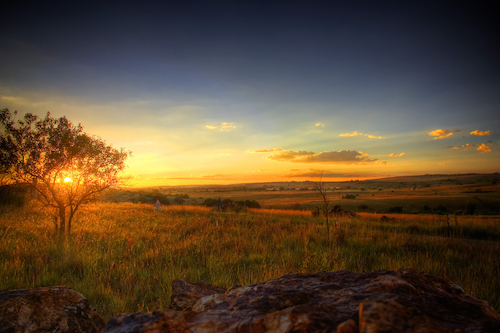 The Cradle of Humankind is one of South Africa's World Heritage Sites. The 48,000 hectare big area in the Gauteng province is renowned for the vast fossil finds in numerous caves surrounding Maropeng. There are actually more than 12 major fossil sites, as well as many more smaller ones, which belong to a place which is officially called the 'Fossil Hominid Sites of Sterkfontein, Swartkrans, Kromdraai and Environs'. Scientists have now announced the discovery of a new human species in one of the caves on site. The initial discovery dates back to 2013, when scientists explored the remote chamber in the cave system. Finally on 10 September 2015, Professor Lee Berger unveiled information about the discovery of the new species which is referred to as the 'Naledi Fossils' at an international press conference. A huge number of well preserved bones were discovered in a sealed-off chamber in the Cradle of Humankind. The scientists are convinced, that this cave, where the fossils were found, was something like a burial cave due to the many fossil elements. This is really a special discovery, as seems to point to the fact that burying the dead seems to have been done before we humans did so, and this actually reveals that this new found species was a species with more humanlike thought-patterns. The new species found at the Cradle of Humankind is referred to as 'Homo naledi'. The word 'naledi' means 'star' in the Sesotho language. The fossil find is an immense discovery, as it contains more than 1,550 relatively well preserved fossil elements and bones. These fossils apparently belong to more than 15 individuals of all ages. This enormous discovery inspires the imagination how the species might have looked, what they ate and how they lived. It was revealed that Homo naledi shares many traits like humans. In size, the species were tall, about 1.5 metres in hight. The hands seem to have been similar to human hands and also they had fairly long legs, maybe for walking longer distances. There are, however, also primitive features like hips or skulls. Skulls were similar to human skulls, the brain, however, very small, in size similar to an orange, so the head size was more like that of an infant. The chamber where the fossils were found, was named 'Dinaledi Chambers', meaning 'Chamber of Rising Stars' for its magnificent cave system. Go to Twitter to read more about the #NalediFossils. The museums complex at Maropeng in the Cradle of Humankind uses exciting interactive displays to lead you through more than 3.5 million years of human history and let you explore the past, present and future of our earth. The nearby Sterkfontein caves are where the oldest fossil hominids 'Mrs Ples' and 'Little Foot', dating back more than 3 million years ago, were discovered. Explore the exhibition at the Visitor Centre and make sure to book an underground tour through parts of the cave. Tours run every half an hour, seven days a week. Location of Maropeng: roughly 50km to the northwest of Johannesburg, northeast of Magaliesburg. Zoom in (click on +) to see the marker. We suggest to buy a combination ticket for both Maropeng and Sterkfontein caves online, to reserve a tour and get a discount. More info here.